We love IKEA. We love their whole approach to doing business. We love going to their stores. We love their products. We love their prices. We even love eating there. A few years ago, we did a brief article on a solar-powered LED lamp we found at IKEA. The lamp is still in use, but the power doesn’t last long enough for our needs. This weekend, while strolling through IKEA, we came upon an LED lamp that may be exactly what we have been searching for: bright, configurable, inexpensive. 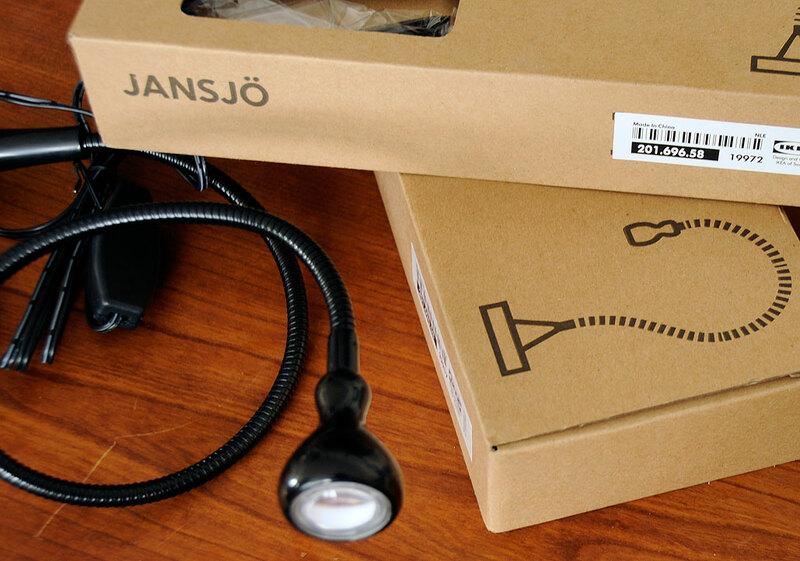 The lamp is the Jansjo, and comes in a few different colors. There is even a stainless steel version. Like all IKEA products, the lamp is flat-packed and some assembly is required. The process is simple and required no more than a few minutes to put together. The steps are self-evident, but there are clear instructions and even a phone number for a help line should there be any questions. Before putting the lamp together, we laid all the pieces (neck, base, AC adapter) out so we could see how everything fits together. We, being who we are, also wanted to get a closer look at the super-bright LED bulb. In order to get at the bulb, we had to first do a little dissassembling of the front plastic lens and reflector. A little gentle prying with a small screwdriver did the trick. With the reflector removed, we had a good view of the entire LED circuit board. What we saw was pretty cool! The LED bulb is tiny. It is surrounded by a few chips and a couple of resistors. Everything was mounted on a wafer board and firmly attached (glued…we suspect) to the housing. We were not able to loosen it in any way. Prying would like just break the circuit board and damage the components. Too bad as this bulb would be a great part for use in other hacks.